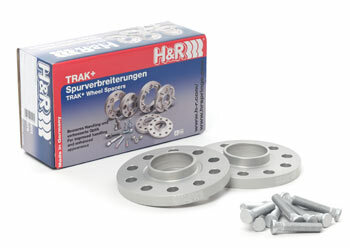 H&R TRAK+® Wheel Spacers allow you to safely widen the track of your car for improved looks and performance. Hubcentric design ensures that k of your car for improved handling and stability. Featuring a 'perfect fit' hubcentric design, TRAK+® Wheel Spacers are extremely durable and lightweight thanks to a proprietary aluminum/magnesium alloy. H&R TRAK+® Wheel Spacers are available in thicknesses from 3mm to 65mm, depending on the application. For vehicle specific information, please visit the H&R Trackplus website.